Donald Trump – Leader of the United States? Whether Americans agree with it or not, Donald Trump was inaugurated as the 45th president of the United States. Growing up, I had always known Donald Trump to be this multi-millionaire business man. He had travelled around the world creating Trump resorts, golf courses and many other vastly expensive ventures. He was seen as “out there” and a bit OTT! From very early on, you knew that Trump would bring a very different approach to politics. Much of the election campaign for his presidency was surrounded by controversy. To this day he continues to shock the world with some of his interviews and tweets which offend people on so many different levels. Most of the star players in this sport come from African American backgrounds and are prime examples of what many believe to be “The American Dream”. Recently some of these stars have taken it upon themselves to use their high status and fame to showcase what they believe is right by protesting. What could be wrong with this? Everyone has a right to stand up for what they believe in… See the next paragraph for this brilliant pun! During the 2016 season Kaepernick chose not to stand during a pregame playing of the national anthem as a show of protest against police brutality and racism in America. In some quarters he received praise for this, however it was unpopular with the NFL’s more conservative favouring fan base. It prompted many back and forward debates about whether sports stars should be using their stature in order to protest a point of view. The most important thing from this was that it then prompted other sports stars from across America to realise they could also use their position of social influence to protest for what they believe in. At a rally in Alabama, Trump took the opportunity to address the predominantly white crowd about his thoughts on the NFL. What was quite shocking about this was the social divide he had immediately created. It was almost as if he liked the idea of the “us against them” mentality. While he used the “people like yourselves” phrase to address the rally crowd, he also branded “those people” – the African American sports stars. Trump unbelievably went on to advise fans to boycott the NFL and speculated the idea that the NFL club owners should actually fire those players who feel they can protest during the playing of the national anthem. The NBA is the next major sporting organisation that has seen Trump involved for all the wrong reasons. In Basketball, it has for a long time been seen as a tradition for the winning team from that season to get an invite to the White House to formally meet the President in office. However this year, Golden State Warriors player and MVP Steph Curry (in other words the player of the year for that season) decided that he did not agree with the President’s views on African American citizens and would not be attending the White House with the winning team. This led to a huge backlash on Twitter. It was so fascinating to see the president of a country getting involved in a confrontation via a social media site! Looking ahead to the future it will be interesting to see if Trump continues to publicly say whatever he wants about a certain topic. He famously is known to personally tweet all of the tweets off his account which is rare with someone who has many millions of followers on the platform. You may think that after all of the controversial moments he has had that he may tone it down online and really take care of the matters which America needs taken care of. In my eye’s it is hard to see how Donald Trump can be a genuine leader of the United States while he evidently shows he does not support everyone who is indeed an American citizen. Just a few weeks ago I was packing my bags, preparing to head off on a little bit of an adventure in Asia. My brother, who has lived in South Korea for five years now, had invited me to visit him in Seoul, where he’s currently settled. And although it meant missing one or two classes from my Communications & Public Relations course, I figured the travel experience would be worthwhile, despite it being my fourth visit to South Korea (and second visit in 2017!). Okay… So I love to travel, and I’m especially fascinated by Korea; its history, its culture, its economic dominance in Asia, and of course, its love for Kimchi (a sort of fermented cabbage delight). But as I was packing, I couldn’t help be aware – even nervous – of the fact that I was about to spend two weeks essentially locked in the crosshairs of Seoul’s nuclear neighbour just 35 miles north of the city. At a time when tensions on the Korean peninsula are at an all-time high – North Korea’s recent ICB missile test, Trump’s twitter tirades and ‘declaration of war’, as well as the US Army’s show of strength dangerously close to the border of North Korea – a vacation in South Korea was seemingly ill-advised. Closing my eyes, sticking my fingers in my ears, yelling “la-la-la-la-la-la-la”, I went anyway. And what I found was remarkably the opposite to what I had expected before setting sail. I mean, I had been to Korea several times before, but not when relations had manifested into physical or visible acts of provocation. I was expecting to witness a subdued Korean people living in an atmosphere of extreme uneasiness, almost as if conflict could kick off at any moment between the two Koreas – or at least that’s how CNN portrayed it. The reality however, couldn’t have been further from my expectation. I found a Korean people apparently unfazed by the recent hostilities on the peninsula. People I met were either happy to greet a tourist, or just too busy glued to their smartphones to even care. Nobody even bats an eye when a Korean soldier in uniform uses public transport. Their concerns appeared to be much simpler; a few minutes-late subway train was considered much more of a catastrophe than the threat of mass nuclear annihilation. Nosedive: Subway passengers using their smartphone on their commute. Besides, my visit to South Korea coincided with Chuseok, a major thanksgiving festival and week-long public holiday for all Koreans. I’m told it’s a pretty big deal. So maybe spirits were relatively high, with people being simply too busy with family festivities to even fathom the possibility of all-out warfare. Or maybe Koreans have become so accustomed to the threat of nuclear annihilation that it has now become part of the norm, almost banal. Similar to the violence during the Troubles; no matter how horrific the event, it just became expected and part of the daily narrative. But as with any trip to South Korea, my brother and I visited the final frontier between North and South Korea: the Demilitarised Zone, or, ‘the DMZ’, if you’re cool. Ironically named, the demilitarised zone demarcates the physical border between the two Koreas, and despite it intended to be a neutralised area, its actually the most heavily militarized border on the planet. So it’s a bit of a misnomer to say the least. Tourists are required to go through several security checks before embarking on the guided tour, and we were even made to sign a declaration of responsibility in the event of our deaths. The tension on the DMZ is palpable. Soldiers from opposing Koreas engage in an incredibly tense standoff from the safe havens of their respective jurisdiction, and we were even lucky enough to hear the distant mumbles of propaganda music played by North Korean soldiers, in an attempt to intimidate tourists visiting from the Southern side of the DMZ. So if that is true, that people aren’t at all fazed by North Korea’s nuclear programme, have the media got it wrong? Are they slightly misjudging the current public opinion in South Korea to the recent hostilities? Do they care more about the bread and butter issues than they do about North Korea? Or does a genuinely credible nuclear threat actually exist on the Korean peninsula as to warrant extensive media coverage? Or maybe, more accurately, as the Guardian reported, some South Koreans are far more worried about the threat of U.S President Donald Trump, than they are their nearest neighbour. Unless you’ve been living under a rock you’ll have seen how badly Theresa May’s speech to the Conservative Party Conference went. First off let’s reiterate just how important the leader’s speech is at any political conference. It’s the only bit anyone outside the conference really pays attention to. In recent years they’ve become dull because party leaders simply cannot afford to mess up so they play it safe. If you want to find the last Leader’s conference speech that was as disastrous, you have to go back to 2003 and Iain Duncan Smith’s infamous “quiet man” speech. Mrs May took to the stage with all the usual pressure and then some. This year’s was even more important as she recently led the party to a disappointing General Election result, there’s tension in the cabinet and Brexit negotiations don’t seem to be going well. With that in mind it couldn’t have gone worse. You’ll have read about the voice loss. You’ll have read about the sign falling apart directly behind her. But the part of the speech that got the most coverage was undoubtedly when comedian Simon Brodkin gave Mrs May a P45, supposedly from Foreign Secretary Boris Johnson. Look at that! That is brutal! It’s iconic and it’s going to follow Mrs May around for the rest of her political career. There’s not much she could have done about the sign falling apart and sure, she could have rested her voice to try and avoid the cough, but once it started she could only struggle through. The one thing she had full control over was (as the stoics tell us) her reaction to the stunt. Ignoring the question of how a man got that close to the prime minister, May’s reaction completely fed into the image of her as an unemotional character. By all accounts she is a very warm person but in this instant we can see a microcosm of how people perceive her. Distant. Staring ahead. Droning relentlessly on. Eventually she took the P45 from the comedian, placed it gently on the floor and continued on with her speech. As he was escorted out by security, she tried a joke about Jeremy Corbyn but by then the whole thing had gone on too long and it didn’t really land. While Mrs May is undoubtedly damning every comedian under the sun, any comedian worth their salt would be able to tell her how to have handled it. This guy was just a heckler. I’ve worked with loads of comedians and they all have their own ways of dealing with hecklers, because being heckled is a part of being a comedian, it’s a skill they have to learn. The best advice I’ve heard for hecklers is “cut them off early and use the crowd”. The crowd would have gone wild for it. If May had ripped up the P45 while she said it, the party faithful would have torn the roof off the place and the press coverage would have shown May as triumphant, not awkward; victorious, not embattled. It’s easy to think of what you should have said in hindsight of course and if I’d been in May’s shoes I might have just cried when I saw that P45, but there was a moment where she could have turned it around, she just didn’t have the skills for it. I think there’s a really important lesson to be learned here, one that has come up already in my studies and that’s the importance of creativity. Suggesting to the Prime Minister of the UK that she sit in on a comedy class would probably have you laughed out of the room, but May has for a long time had the communication problem of seeming like she’s incapable of reacting to other people naturally and in that context comedy classes could be a creative solution to a genuine problem. So my question is this; What’s the most creative/left field/wacky solution to a communication problem that’s worked in real life? Tweet, email or comment, I’ll update if I find any really good ones. Jason Ashford is studying for a MSc in Communications and Public Relations with Political Lobbying at Ulster University. He can be found on Twitter @jasonashford89. Pourquoi, the French word meaning why. A question that I’ve been asking myself several times since moving from Toulouse, situated in the sunny South of France back to the cold, rainy hills of Donegal. I was happy there, felt settled and have made some lifelong friendships. One word stands out in that sentence to me. Settled. In my eyes, being settled in this context is synonymous to being in your comfort zone. Does anybody like the feeling of change? It can be rather scary and overwhelming at first. Anyway, I decided a change is what I needed to gain a career I’ll enjoy. During the first week of uni, our lecturer, Conor McGrath, told us to question everything in PR – including his own words. I find this a refreshing outlook to have in life in general. Mind you, since moving home, I’ve already had the joy of attempting to answering why the simple things in life are the way they are to my four-year-old niece! Is it just me or do we seem to lose this curious nature the older we become? We don’t seem to question anything until it directly affects us. During the same week, someone else asked me about the master’s course I was going to be studying. When I told them about it, the response I got was ‘Oh, public relations, are they going to train you how to answer the phone?’. Oh, touché my friend. A few hours later, I was reading the first paper we had been given for our seminar the following week. One part of the paper stumbles upon the professionalisation of public relations. It briefly comments on how there are few people outside of the profession that accept it as that: a profession. It made me realise how oblivious many people are to what is behind PR and the power in which it holds from the way we view the world to how we view people in the media. Perhaps this ignorance plays to the advantage of PR practitioners. Or am I already feeding into that stereotype of PR practitioners being nothing but untrustworthy beings out to do us all wrong? Having just finished my second week on the course, I find myself questioning one event. PM Theresa May’s speech at the Conservative Party Conference. Firstly, the lyrics ‘Who knows why it’s gotta be this way?’ from Rihanna and Calvin Harris’ song ‘This is what you came for’ filled the room as she entered. Why pick this song? I’m guessing this is her attempt to form a link between herself and the younger supporters of the party? Right, so she is making light of what just happened. Top marks for having a witty response on social media within hours of the event happening. But can anything help her reputation at this point? Today, the day after the conference, numerous ministers have been backing her publicly. However, former Conservative minister, Ed Vaizey, has suggested that numerous MPs feel it’s time for her to resign. Her lack of leadership is evident but who would replace her during this crisis? I have many British friends living in France, currently EU citizens living in another EU country, wondering what Brexit has in store for them and their livelihoods. Theresa May isn’t exactly giving them the picture of hope. Likewise, she isn’t giving me any hope. I live a short 15-minute drive to the border of Northern Ireland and I had no say in the Brexit vote yet the outcome of what is yet to come will potentially affect my town and community. As a final year student, I am currently writing my dissertation. The topic I chose to explore was Public Relations and Lobbying within the agriculture industry, as the recent news topics sparked my interest as a farmer’s daughter. 2015 saw the farming income for Northern Ireland fall from £311.8m to £182.5m, which was largely due to supermarkets and processors driving down farm produce prices. This was not an issue just within Northern Ireland, but throughout the whole of the UK. So to understand why this campaign matters so much to farmers, I will explain the complex system (for myself if nothing else). Dairy farmers milk their cows twice or three times a day 365 days a year, which is collected by a milk tanker (nearly every day) to be taken to the processors where it will be pasteurised for human consumption. The majority of dairy farmers are locked into a contract with these processors and unable to leave. Combining the facts that supermarkets and processors are cutting the prices of milk and the inflation of the prices of fuel, feed and production, farmers are struggling to keep their farms afloat. They can’t stop feeding their cows or harvesting crops as (1) it is cruelty to animals and (2) a farmer’s actions will have a long term effect in how they can run their farm in the future. Discouraged by this, farmers took to protesting, which sparked the biggest grassroots campaign the farming industry had seen in recent years; partly funded by the Scottish Government who contributed £100,000. This campaign achieved national media coverage and saw the issue fought through social media, peaceful protests and farming coalitions who communicated on behalf of the farmers. SOS Dairy harnessed the full power of the Internet through using Twitter, Facebook and YouTube to bring the farmers together and to share the issue with the general public. More than 800 individuals added the SOS Dairy ribbon to their profile photos on Twitter, with hundreds more showing the same support on Facebook and using the #SOSDairy hashtag. During this campaign a video called ‘The #SOSdairy song,’ made up of protest footage, became an Internet hit, gaining over 38,000 hits on YouTube. Through the videos’ popularity, the BBC approached the creator to request he preform it on the radio- enabling them to promote the cause further. To demonstrate a united industry, the issue saw farm groups set aside their differences to form a coalition between NFU Scotland, NFU Cymru, the Royal Association of British Dairy Farmers, Tenant Farmers Association and the Women’s Food and Farming Union. It also brought together those who relied on the farming community such as farming suppliers, vets and lawyers all over the country. Whilst leaders of the coalitions held talks with the processors and supermarkets to achieve fair prices, the farmers named and shamed the milk processors and supermarkets while carrying out protests throughout the country by obstructing processing plants night after night, to show their strength. Through this campaign major supermarkets backed down by announcing fairer prices for farmers who directly supplied the supermarkets, and processors eventually backed down and in result abandoned their second price cut. A poll carried out by YouGov and The Grocer found that 83% of the public were aware of the protests and 67% stated they think farmers should be paid more, even if it increases the price of milk. Although this campaign achieved what it set out to do, capturing the public interest and winning the support of the consumer, there is still a long way to go for the industry in order to create a sustainable industry where farmers will profit. Lauren Sharkey is a 4th year CAM student at Ulster University. She can be contacted on Twitter @lsharkey_37 or on LinkedIn at www.linkedin.com/in/lauren-sharkey-25776ab0/. Since my last political post faired out so well, I have decided to continue to include my own opinion on the going-on’s in Northern Ireland’s ever-changing political landscape. If Facebook was invented during the Troubles, I can only imagine that the war would have been fought with a keyboard instead of with guns. As social media has grew in popularity, a steady decline of humility and feeling has occurred. This negative correlation showed itself to me firstly when Margaret Thatcher died, as thousands flooded my timeline to show their courtesy – yet simultaneous disrespect – to her death. However, on 21/03/2017, I was genuinely shocked to come on to Facebook and Twitter, and see so many disgusting comments at the death of Martin McGuinness. A man without whom Northern Ireland would still be very much stuck in the 1980’s. As Margaret Thatcher is the only person who comes to mind when trying to compare the two political giants’ deaths, I must remind you of the background of each character. Baroness Thatcher came from a well-to-do family and grew up in a quiet market town in Lincolnshire. Martin McGuinness was raised in the Bogside of Derry City, which to those who haven’t studied an ounce of NI history (half of my Facebook timeline), was a highly deprived area where Catholics were discriminated against at the electoral polls and at the housing executive. He left school at the age of 15 and without the right education behind him to express his anger at the British Government through speech, he delved into the violence that was rife at that time throughout NI. I found this tweet sums up a great deal of Martin McGuinness’ early years. If telling Martin McGuinness' story, don't start at his joining the IRA. Start with the wretched, violent, bigoted state forced upon him. This is not a post to make excuses for McGuinness’ early years, when he was obviously under the influence of the romanticised Irish patriots of the 20th century, but instead a post to commemorate his final 20 years where he pushed for change for Northern Ireland. The progress he made throughout his political career is unparalleled – being the chief negotiator for Sinn Fein and Irish republicans through the 1998 Good Friday Agreement, and staying with the power sharing Executive throughout its 19 year period. He too had to make compromises when dealing with the opposition who he fought with violence so vehemently just years previously. His warm and witty personality caught the attention of US President Bill Clinton, who spoke at his funeral. The most poignant part of Clinton’s speech was when he mentioned Nelson Mandela. The South-African freedom fighter has come to epitomise peace and revolution – despite being involved in similar militant tactics as a young man. Clinton said that in a conversation with Mandela, Mandela told his people “if I can get over ‘it’ you can too, we have got to build a future”, which is exactly the attitude Martin McGuinness had when realising that until republicans and loyalist sides learned to move forward together, they wouldn’t move at all. 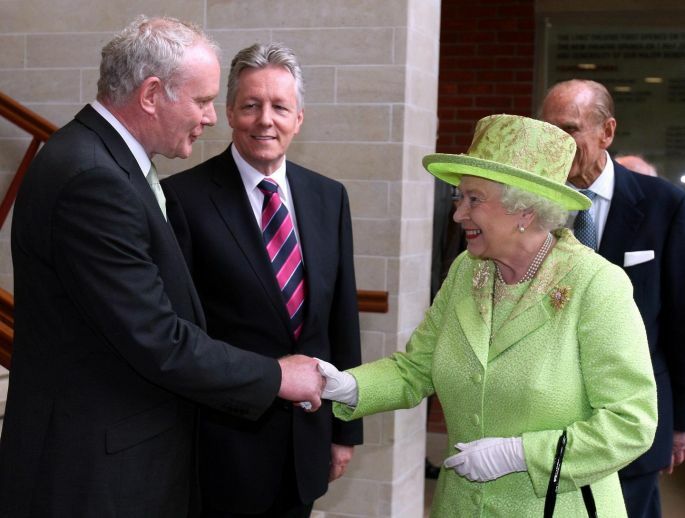 If the Queen can shake Martin McGuinness’ hand although he was head of the IRA when her cousin Mountbatten was murdered by them – then surely everyone can pay respect to him (or perhaps not react at all), because after all he is a human being. It is easy to judge someone when you only see them in black and white. 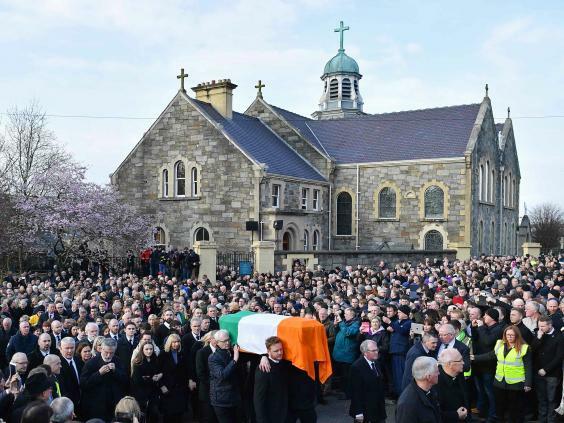 But when I think of Martin McGuinness, his past reflects a rainbow of triumphs and turbulence. Shannon Quinn is a 2nd year CAM student at Ulster University. She can be contacted on LinkedIn at https://uk.linkedin.com/in/shannon-quinn-556236132 and on Twitter @ShannonQuinnPR.